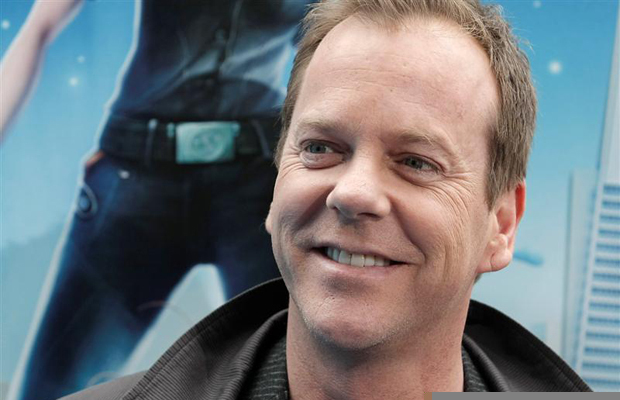 Kiefer Sutherland is a Canadian born actor, producer and director. He rose to universal fame by his portrayal of the government agent Jack Bauer for the Fox television series 24 and has also received numerous accolades for this role. He has appeared in over 70 films and is regarded as one of the best actors in Canada today. Sutherland was born as “Kiefer William Frederick Dempsey George Rufus Sutherland”, to Donald Sutherland and Shirley Douglas (both of whom were well established actors) in St Mary’s Hospital, Paddington, London, 1966. Soon, his family moved to Canada, though his parents ended up getting divorced by 1970. He consequently moved to Toronto with his mother and started attending Crescent Town Elementary School, followed by St. Clair Junior High East York, and John G. Althouse Middle School where he received most of his education. Eventually realizing his passion for acting, he also chose to attend a series of weekend acting lessons at the renowned Sir Frederick Banting Secondary School in Ontario. Stand by me (1986) was the first film Sutherland did. The movie, while not a commercial success, brought Sutherland a wealth of opportunities to hone his acting skills. To date, he has appeared in an excess of over 70 films, some more prominent than the others like Twin Peaks: Fire Walk with Me (1992), Young Guns (1988), Young Guns II (1990), A Few Good Men (1992), Flashback (1990), The Cowboy Way (1994), The Vanishing (1993), The Three Musketeers (1993), Eye for an Eye (1996), Taking Lives (2004), Dark City (1998) and The Sentinel (2006). However, it is his portray of government agent Jack Bauer for the Fox crime drama 24, that he is most well known for. The show was a critical success around the world and numerous critics and publications were keen to praise Sutherland for his take on the lead character of the show. The acclaim was so widespread that he ended up being nominated for the Best actor in a Drama Television Series at Golden Globe Awards numerous times, even winning it once in 2002. While in his role as Jack Bauer, Sutherland received an estimate of $40 million for filming three seasons, which made him the highest paid television actor of the time. By the eighth season Sutherland had to leave for an elective surgery which delayed shooting for the show. He has also reprised his role for the 24 movie. Apart from acting, Sutherland has also provided his voice for a number of advertisements for companies like Ford Motor Company of Canada, Apple Inc, ESPN (as narrator for the United States Men’s National Soccer Team during the 2014 FIFA World Cup) and the Bank of America. He has also provided his voice for high profile video games, like Sgt. Roebuck Call of Duty: World at War and is now set to be the voice of Snake in Metal Gear Solid: Ground Zeroes and Metal Gear Solid: Phantom Pain. Kiefer Sutherland has been married twice, first to Camelia Kath (from 1987 to 1990) and then Kelly Winn (from 1996 to 2008). He was also briefly involved with fellow actor Julia Roberts. He has a daughter, Sarah Sutherland, from his first marriage. Sutherland has expressed that he is a fan of music, possessing a large collection of guitars, most of which are Gibson Les Pauls and is a diehard fan of the rock band Queen. He is also a fan of American football and Ice hockey and supports USC Trojans and Toronto Maple Leafs, respectively.